Wow, I can’t believe our family’s Choose Your Own Adventure trip has finally been fulfilled! It was such an incredible vacation (equal parts busy and equal parts R&R) that I’m looking forward to sharing more about it with you this week! In the meantime, I have been knee deep in laundry, grocery shopping to replenish the very empty fridge, and I have been doing some food prep this week to try to get ahead. I hope to try and doing a little making ahead each week since our family life has gotten quite busy between dance lessons, cross country meets/practice, and instrument lessons. I shared this photo on Instagram and had a few people ask me how I made certain things for the week so I thought maybe sharing it here so you could not only hold me accountable (something I can always use), but I hope it might inspire you to get a little ahead during your busy weeks! I must say that Shutterbean has been such an inspiration to me in this department-have you read this post on make-ahead planning? I also love to follow along with her hashtag to think of new ideas that I can do ahead in my kitchen! The biggest thing for me is my desire to decrease the amount of food waste we have in our house. If things are pulled together, frozen, and incorporated into our dishes, there is less chance of those items going to waste in our home. For me, it’s also less about menu-planning and more about thoughtful preparations that can be pulled together for the week ahead whether it is breakfast, lunch, or dinner. 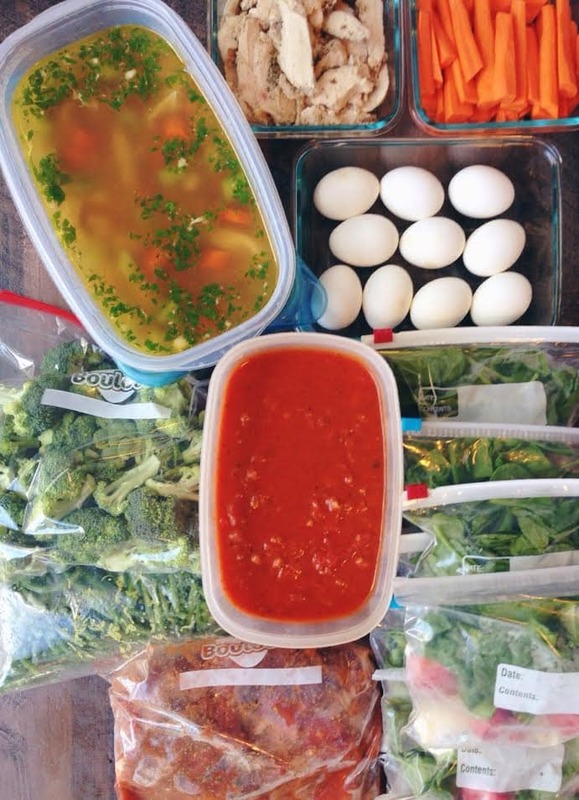 For menu-planning advice, I’m An Organizing Junkie is a pioneer for Menu Planning Mondays where you can gather so much good stuff each week and you can start brainstorming what you can make ahead for your meals each week. Here is what I got ready for our crazy activities week! For a couple of hours of cooking and prepping, I’m hoping we can stay on track with our family’s eating this week!